Idaho's state parks have been called the "jewels" of the Gem State. The story of how those jewels came to be involves political intrigue, much resistance, some philanthropy, and a touch of irony. Sen. Weldon B. Heyburn famously said that state parks were "always a political embarrassment." Idaho's first state park was named after him. Today, Idaho's 30 state parks host five million people a year. Visitors come to boat, camp, bike, climb, hike, fish, and make memories in the great outdoors. 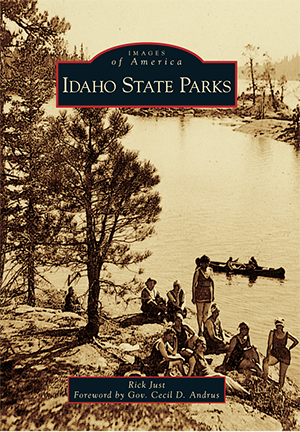 This book tells the story of Idaho's diverse state parks—from Priest Lake in Idaho's panhandle to Bear Lake in the southeast corner of the state—through a wealth of historical photographs. A variety of parks are featured, including ones that were lost, found, or never came to fruition. As president of the Friends of Idaho State Parks, Rick Just pulled photographs from the archives of the Idaho Department of Parks and Recreation—as well as family albums, the Idaho State Historical Society, the Idaho Statesman, and the National Park Service—to develop this history. It is presented with the hope that learning about the past will encourage those in the future to keep these jewels open and welcoming to everyone.